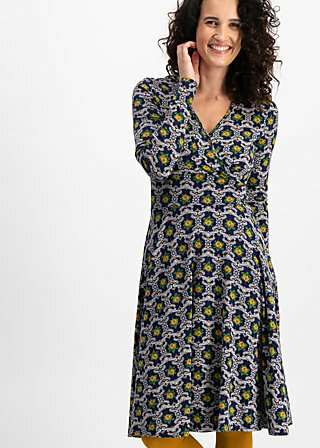 Knee-length single jersey dress with delightful all-over prints – a typical Blutsgeschwister firework of textile colours and patterns! The wonderfully feminine long-sleeved dress in a comfortably soft cotton-modal quality has overcut shoulders, a wide, flared skirt part and an overlapping V- neck that shows off your décolleté. Thanks to the low elastane content, the dress is wonderfully elastic and promises lots of feel-good moments. Special Blutsgeschwister features: Playful tucks in the upper part and a delightful satin ribbon with an old bronze-coloured metal pedant fastened to the right waistband seam are proof of our brand's creativity and attention to detail. Behind colour 3 a very special story is hiding, as we have revived our favourite most favourite pattern from the past. Glamour(d) rama Yeah!